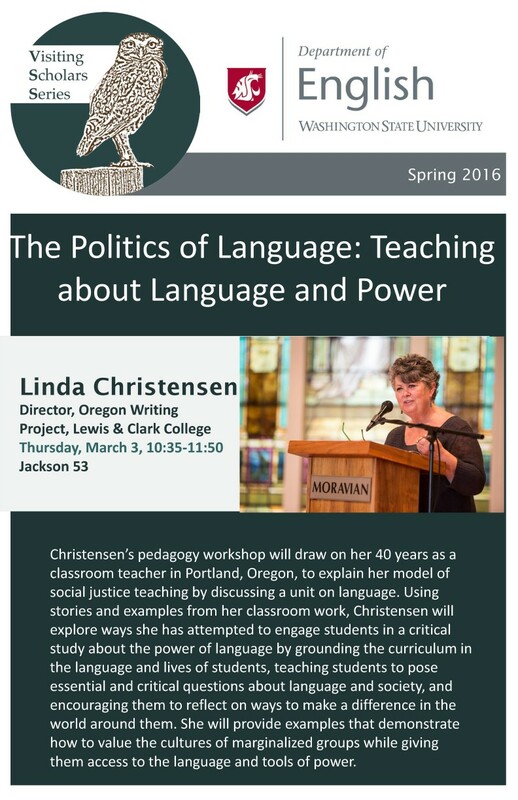 Linda Christensen is the Director of the Oregon Writing Project (OWP), located in the Graduate School of Education at Lewis & Clark College. She’s the author of Reading, Writing, and Rising Up: Teaching about Social Justice and the Power of the Written Word and Teaching for Joy and Justice: Re-Imagining the Language Arts Classroom. She has given keynote addresses at local, national, and international conferences about her work on literacy and social justice. She taught high school Language Arts and worked as Language Arts Curriculum Specialist for thirty years in Portland, Oregon. She is a member of the Rethinking Schools editorial board. She has received numerous awards, including the Fred Heschinger Award for use of research in teaching and writing from National Writing Project and the U.S. West Outstanding Teacher of Western United States and most recently, the Humanitarian Award from Willamette Writers. In this talk, she will discuss the noisy intersection between competence and correctness as first generation students navigate their way through college. How do they learn to code-switch from home language to the language of the academy? How can they keep an authentic voice and write with power and confidence? Her workshop will draw on her 40 years as a classroom teacher in Portland, Oregon, to explain her model of social justice teaching by discussing a unit on language. Using stories and examples from her classroom work, Christensen will explore ways she has attempted to engage students in a critical study about the power of language by grounding the curriculum in the language and lives of students, teaching students to pose essential and critical questions about language and society, and encouraging them to reflect on ways to make a difference in the world around them. She will provide examples that demonstrate how to value the cultures of marginalized groups while giving them access to the language and tools of power. to Frances Harper, Anna Julia Cooper, and Sutton E. Griggs. and why might this work matter to us now?